It’s our final post in our “What to Wear” series! If you read our “How to Transfer Your Credits” post, you’ve already met Community Leader Paige Sowder. Paige, a student at The University of Texas at Austin, is incredibly enthusiastic in all that she does…and her fashion sense and dedication to Go Global serve as no exception! If you’re one of our prospective GO: Rome students, here is your guide of everything you’ll need to know as it pertains to dressing in Rome…as told by Paige. They don’t have the saying “When in Rome” for nothing, so when I was abroad, I found accessories to be one of my best assets. 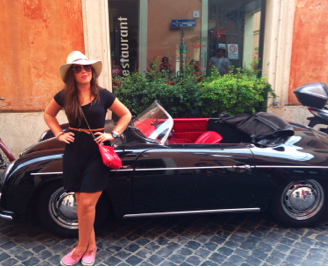 Italians take pride in their clothing and often have a very chic street style. Don’t be afraid to play with crazy sunglasses, hats, or bold patterns because if there’s anywhere one can pull it off — it’s in a fashion conscious country such as Italy. Comfortable shoes are a must for traveling and sightseeing, but I tried my hardest to dress as stylish as possible to blend in… and for pictures of course. One of my favorite stores abroad was Brandy Melville, which was all over Europe and also located in California and New York. All of the clothes scream European with the dark colors and chic designs. The activities that take place on the Rome trip consist of wine tours, museum visits, and lots of gelato. A nice maxi skirt with a simple top creates a look that doesn’t seem overworked but with the right accessories makes a sharp appearance. I also found that your clothes don’t have to be pricy to look great. Many of my items came from stores like Target. While studying abroad in Italy, I was able to visit several amazing coastal cities including Capri, Positano, and the Amalfi Coast. Each of these present great opportunity to get some sun and show off great beach looks. A bathing suit or two are essential for the coastal travels. I often paired a casual dress or high-waisted denim shorts and a crop top over my bathing suit for the day’s other activities. I, for one, don’t go anywhere without my sunglasses, so I made sure to include those. Despite having wet hair and going in and out of the water, there is still great opportunity for accessories. I often wore a scarf tied around my head like a headband, and many of my friends donned fabulous floppy hats. Once again, Italy is a great place to experiment with your style and try out different accessories that don’t typically fit for normal occasions. The Rome trip provides opportunity for weekend travel, which means Friday and Saturday nights in great European cities. Most of these call for a dressier outfit that can take you from sipping on cappuccinos at a bistro to cocktails at a nightclub. For this, I went for fun dresses that had vibrant designs and beadwork. While in Paris I wore a dress that I had gotten from Zara in Rome. It has loud patterns with crazy colors, but is elegant in its own way. This category is one of the most fun because you have much more creative freedom than sticking to the little black dress. A hot pink floral romper, high-waisted leopard pants, and other eccentric options are all appropriate for European nightlife. This lack of guidelines makes picking out clothes an exciting experience. There you have it! Everything you need to know about what to wear in Rome. 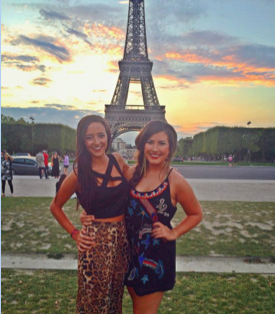 It’s our goal that you are just as excited about your 2015 GO:Rome trip as Paige is about sharing her experience with you. Next up…stay tuned for our complete packing list, coming soon!